Unfortunately, a lot of common misconceptions surrounding women’s place (and capacity for success) in business still exist today. Luckily for us, when it comes to myths, common misconceptions, stereotypes, you name it, SCORE’s spring 2018 “The Megaphone of Main Street” data report on women-owned businesses is here to set the record straight. After checking the report out, we decided to dive deep into the points we hear most frequently, the ones most of us have been conditioned to accept as fact, and provide you with data and real-life examples to rewrite the narrative. With that, let’s kick these myths to the curb and recognize the tools and traits successful entrepreneurs actually possess. Nope! According to the Megaphone of Main Street, women are more likely than men to start a business, with 47% of women vs 44% of men polled answering yes to starting a business in the last year. And this number’s on the rise, increasing by 45% in the last 10 years. Women makeup 38% of the 28 million small businesses operating within the United States, and employ nearly 9 million people, all the while generating $1.6 trillion in revenues. So, mark this one as debunked. Not only are women making up more than a third of small businesses, they’ve proven to be even more likely to start their own in the first place. Lifestyle businesses are businesses run for the purpose of sustaining a certain level of income and no more, with little focus on growth or revenue success. Lifestyle businesses are great and all, but it would seem as though the 62% of women entrepreneurs that depend on their business as their primary source of income would disagree with this one. Women are also more likely than men to start businesses in the healthcare and education industries, and 19% of women-owned businesses operate in the service industry, compared to the 15% of men-owned businesses that do. If you don’t live under a rock, you’ve most likely heard of Orangethoery, known for its high-intensity workouts crafted with a mix of cardio, endurance, and strength training. Its CEO, Ellen Latham, founded the business in 2010 and topped 2017 as Forbes’ fastest growing women-owned business with $451 million in sales and 700 franchises nationwide. Orangetheory’s certainly not the only example, but I could honestly go on forever. 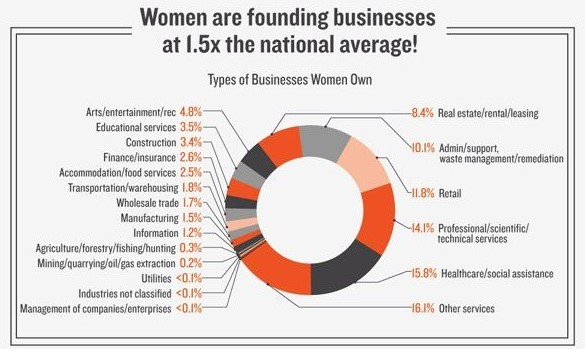 We’ll save my time and yours with this infographic that shows the percentage breakdown of women-owned businesses in some major industries. 15.5% of both men-owned and women-owned businesses predicted static revenues in 2018, and 9.5% of men-owned predict a decrease in revenue, vs the 9% prediction from women-owned. 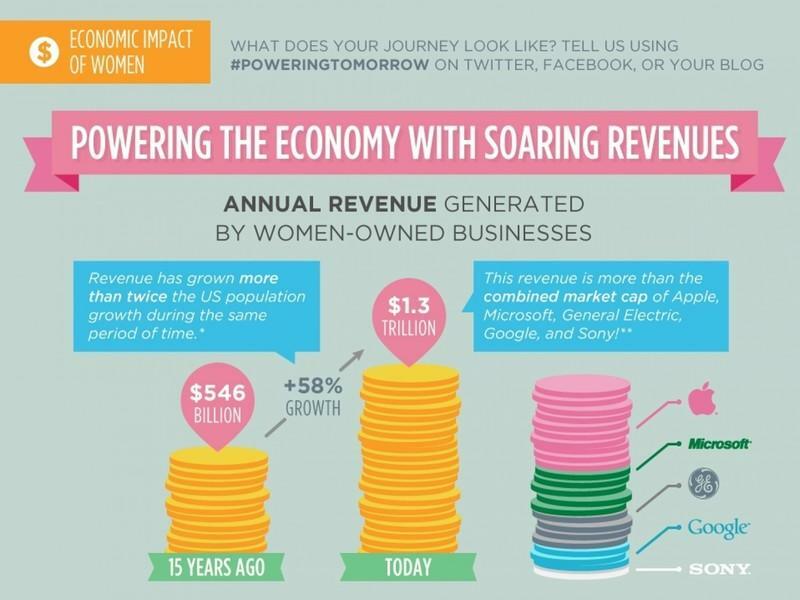 Here’s another handy infographic focusing on the incredible impact women-owned businesses have had on the economy. With an annual revenue of $1.3 trillion, it’s safe to say women-owned businesses aren’t just surviving when it comes to revenue production, but they’re cashing in, big time. It’s undeniable that women-owned businesses are producing results, so we’re thinking you’ll have a similar reaction to this next one as we did. As previously mentioned, there’s really no difference in reported success between men-owned and women-owned businesses. Of the entrepreneurs that participated in the study, 33% of the men and 34% of the women reported that their business was struggling (we’re all in this together! ), and 32% of both men and women reported that their businesses are maintaining their current size. 28% of men and 29% of women reported that their business is expanding in size and revenue, and 7% of men vs 5% of women reported aggressive expansion. Not even close, but it stinks to have to disprove this one. Unfortunately, the financing of ventures is where the real gender disparity lies is the business world. So much so, that a 2014 Senate study found that despite making up 38% of all small businesses, only 4% of all small business loans go to women. As a result, men are more likely than women to seek financing for their business in the first place (34% compared to 25%), and the women that do are still less likely to succeed in acquiring the financing their business needs to grow (38% compared to 31%). In order for the amount of women-owned businesses to continue to increase every year, this number has to start to change. The results of the study are hard to ignore; entrepreneurs with access to a mentor are 5 times more likely to start a business than those without access to one, and women entrepreneurs, specifically, find greater success, regardless of the gender of their mentor. The truth is in the numbers: 87% of businesses owned by entrepreneurs with access to a mentor are still in business after one year, compared to 75% of those without. The relationship between a male mentor with a female business owner reported the same satisfaction level regarding helpfulness, open-minded listening, respect, and relevant advice. Suffice it to say, business-owners benefit from the experiential wisdom of those who have previously lived through the woes of starting and running their own businesses, and gender has proven to deserve no place in the conversation. Rather, respect and competence are cited as the most relevant factors driving the success of a mentor-mentee relationship. With the number of women entrepreneurs increasing every year, and considering the challenges women-owned businesses still face in their financing efforts, mentorship for women-owned businesses is a must. However, the role of mentorship is not only vital to the continued presence and success of women-owned business, but the future of business entirely. If you still believe any of these myths, there’s really only one thing left to say: Scoreboard. Biz Tips: How Do People Use Social Media in 2018?